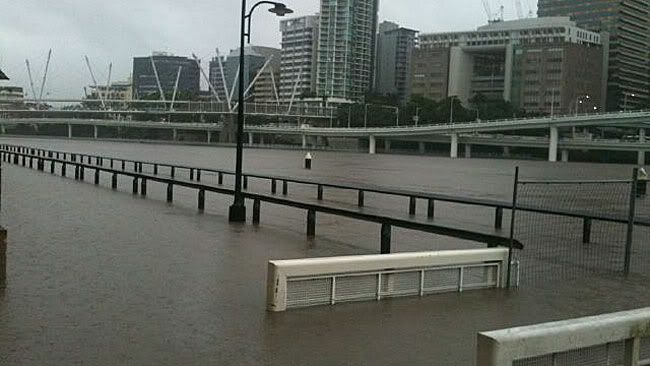 This time last year Brisbane was flooded. Those photos I showed you were taken this year. Last year the place was a mess. 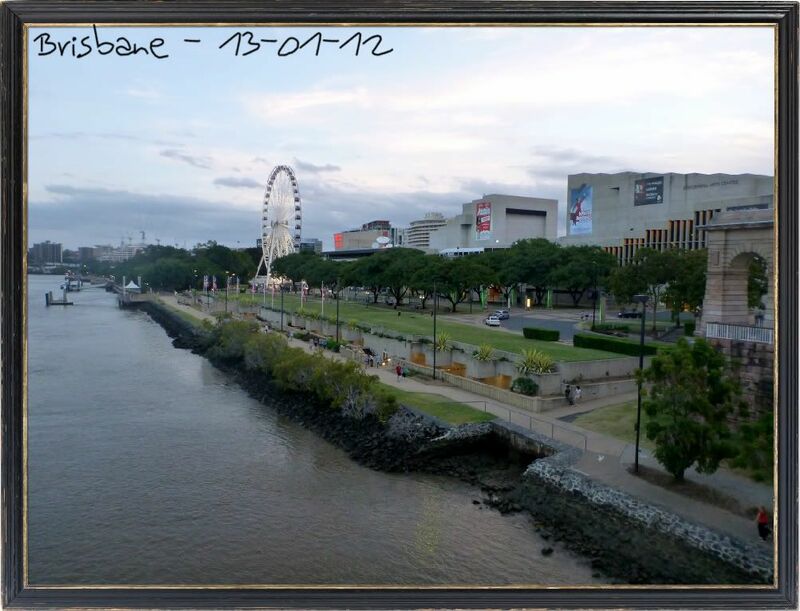 I was walking down the board walk at southbank when I took those photos. This photo below is taken from up on the bank of this area. Not far from where the wheel is. That whole area was underwater. 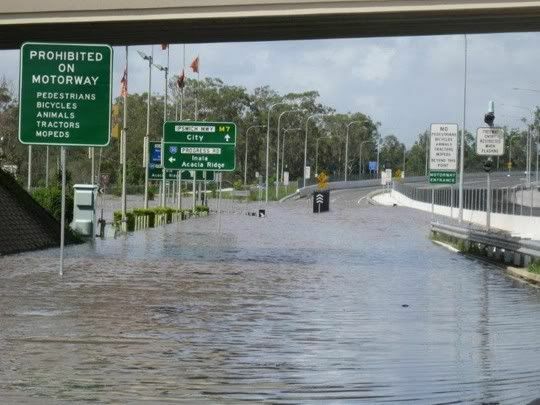 It all started with flash flooding in Toowoomba 2 hrs drive from Brisbane. It started to rain and within 15 minutes there was a flash flood down the main street of Toowoomba. Down in Brisbane we had been having constant rain for days. When that stopped on Tuesday we were thankful as our dam was 10cm from going over. This wouldn't be good either as the water from Toowoomba and Grafton floods was heading our way as well as the water being let out from the dams so that it didn't overflow. 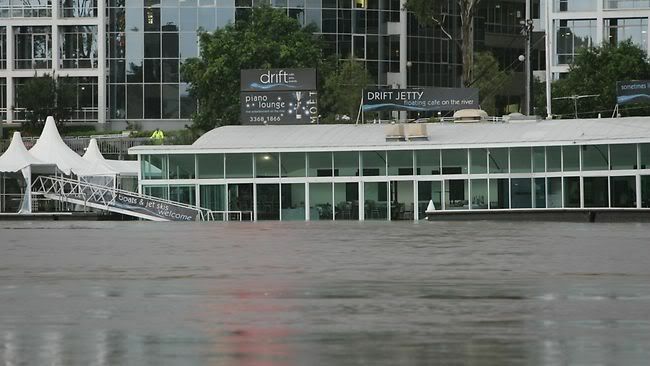 Ipswich which is upriver of Brisbane went under by 20 something metres. Whole streets went under. 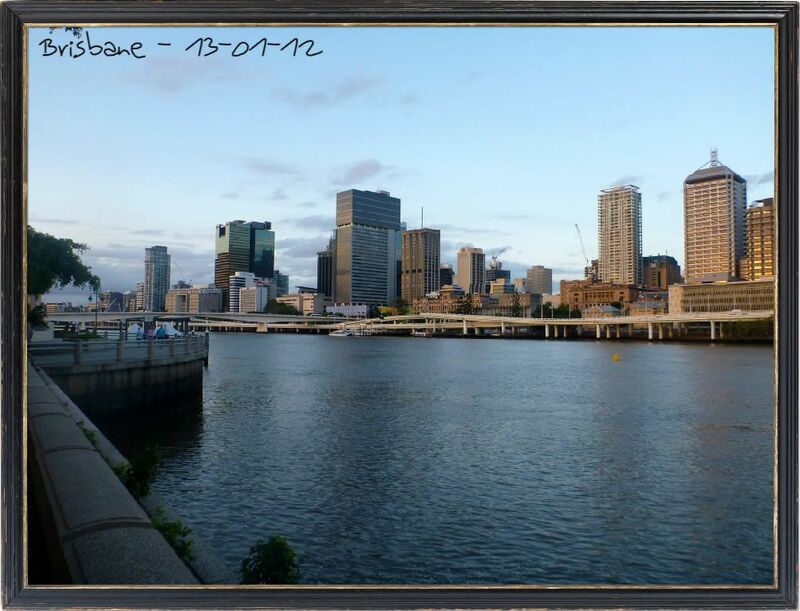 Brisbane went under 5ms but it was flatter land and a lot more people were affected. This is another photo from the southbank area. These sit up away from the river a little bit. but you couldn't tell from this photo. This site has some very interesting photos. There are areas of Brisbane that still haven't been cleaned properly with houses in ruins. But the best thing that came from it was after the flood waters cleared was the absolute mass of volunteers surging in from everywhere that didn't get affected to help with the cleanup. They had so many volunteers they couldn't actually find work for all of them. Stores sold out of gumboots. It was amazing to see the support from everyone and the help they could give in the time of need. 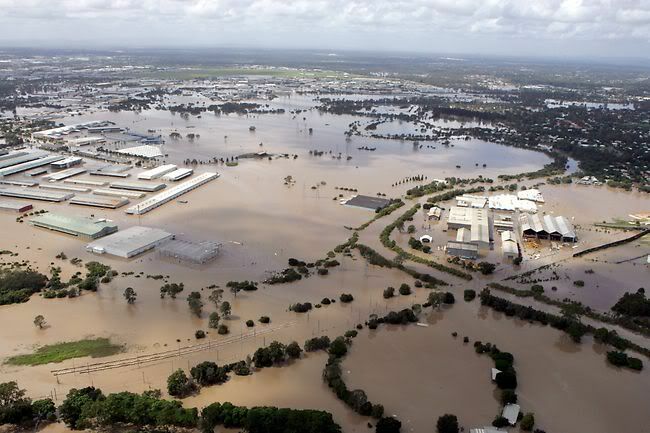 Oh and while brisbane was flooding so was most of Queensland, plus northern new south wales which flooded 3 times in that year alone. Then the only part of Queensland not flooded was devastated by a cyclone a couple of weeks later. Oh the fun of Australia! 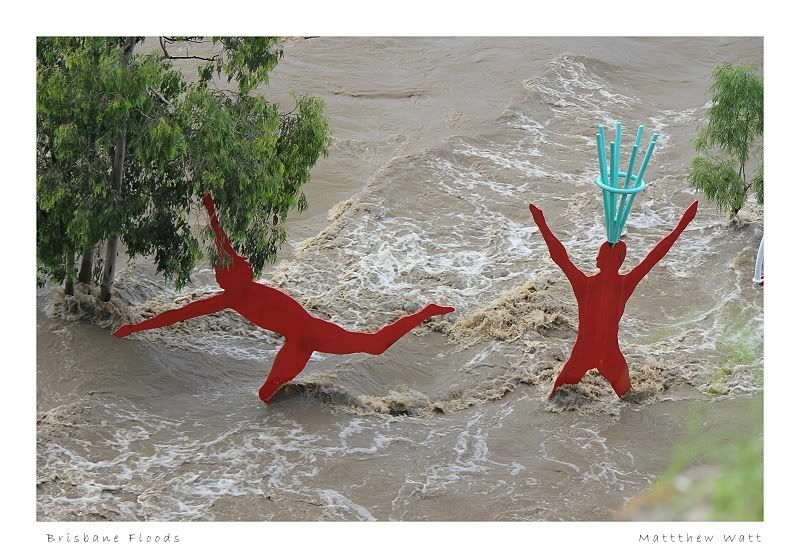 Hopefully this year will start better and it will be another 35 years before we see another flood like this one. How awful it must have been for those effected. Oh dear..all the people is Australia are in my prayer and thought .. Fingers crossed that it won't happen this year nor for a long long time. Wow...how scary this must have been for everyone. Where I live in the US, we are prone to Hurricanes and when they come, many sections of our city get flooded really bad. The worst part is that unless a house is in a designated "flood zone" as stipulated by the city, a person can't get flood insurance for their home. So basically if a flood hits their house and they have no insurance, the owner has to pay all costs out of pocket to fix their home. It is really sad.